Few things say Halloween more than solving a murder mystery. The W.K. Gordon Center, located in Thurber, is hosting, Museum after Dark: Murder at the Museum on Saturday, Oct. 13 at 7 p.m. The W.K. Gordon Center, located in Thurber, is hosting, Museum after Dark: Murder at the Museum on Saturday, Oct. 13 at 7 p.m.
Adams says the event is hosted to reach Tarleton State University students. “We are part of Tarleton and we want students to know we are here. We wanted to have something for you guys to come out,” she said. This is the second time that the museum has had a murder mystery night. “Before we had just done like a flashlight scavenger hunt, which worked out well but we thought that we could expand a little bit. We wanted to be a little more creative with it,” Adams said. Attendants of the Murder Mystery event will get the opportunity to solve a real murder from Thurber’s history. “We found some murder files in Thurber’s history and we pulled off of those to create a murder mystery night. The murder that people will be coming to solve is an actual murder that had an actual murderer and went to trial in Erath County. We are gonna see if they can crack the case as well,” said Adams. When you arrive, you will be given a case file to start off the investigation, “that has all of the information they’ll need to get started” including: a list of potential suspects, space to write notes and a brief rundown of the case and what happened that night. People will be able to examine the evidence room, talk to the “sheriff” that was the officer at the scene of the crime and see photos of the suspects to know who they are looking to interview in the museum. “After that, they are free to wander the museum and question the suspects to see where they were when the incident happened. They can try to piece together their stories to see if they can figure out who committed the crime,” Adams said. There was a large turn out last year and they are hoping even more people come this year. “People that just kinda want to see the museum in a different light, and people who have never done a murder mystery before should definitely come out because it is a whole lot of fun. People who just like puzzles, if you like puzzles you’ll like this. It’s really for anybody who just wants to do something a little different on a Saturday night and get out of the house and have a little bit of fun,” said Adams. The murder mystery event is not the only thing happening at the Gordon Center this October. “We have all kinds of events all year long. We do classic movie screenings every couple of months. We actually have one in October where we will show “The Most Dangerous Game” from 1932,” Adams said. Other events coming up include an art program and a holiday music program. “We have an art program that we will do coming up in November where people can come and it’s kind of like one of those Painting with a Twist kind of nights. They can come and do their own painting, led by someone from the Cross Timbers Fine Arts Council. Every year we have a holiday music program right before Christmas and before everybody leaves for winter break. We just celebrate the season and take some time to just have some fun and relax with our friends and family. This year we have an Irish band coming out from Dallas, so the Irish Rouges will be here and we have food and it’s free admission. Almost all of our programs have free admission,” said Adams. For a calendar of events happening at the Gordon Center you can look at Tarleton’s calendar. 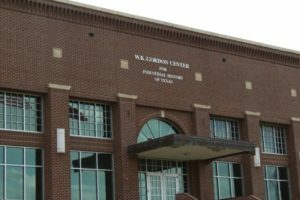 The Gordon Center is open Tuesday-Saturday from 10 a.m. to 4 p.m. and on Sunday’s from 1 p.m. to 4 p.m. Admission is free for Tarleton students, faculty, and staff.